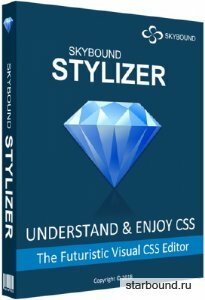 Skybound Stylizer 7.18.904.712 » Компьютерный фотомонтаж своими руками. Фотошаблоны, картинки и клипарты для Фотошопа (Photoshop). С помощью Stylizer вы сможете начать редактировать CSS код просто введя адрес сайта в адресной строке встроенного браузера, после чего программа покажет вам атрибуты CSS кода в правом блоке интерфейса программы, где вы сможете напрямую редактировать или дополнять новые атрибуты в режиме реального времени. Программа весьма легка в использовании и вы сможете освоить ее всего за несколько минут. • Say goodbye to the reload button! Stylizer knows all the latest CSS 3 standards, and provides a real-time Warnings list that updates without delay, as you type. You'll also see a subtle red underline wherever your CSS does not validate. Stylizer even recognizes many common CSS "hacks" to ensure that the Warning list only contains actionable errors. Bullseye transforms your workflow into an efficient point, click, and edit process. Using Bullseye is as easy as tapping the space bar, and clicking on the page element that you want to style. All matching CSS rules appear with the most specific rules appearing at the bottom of the list. Enter the address of any website in Stylizer to start editing the CSS. Or load an HTML page directly from your Mac or PC. Linked CSS files open automatically in Stylizer so you can start editing right away. One click is all it takes to switch between any of Stylizer's integrated browsers. Stylizer automatically injects your changes into the new browser so you can switch browsers while your work is in progress and not yet saved. Stylizer saves your CSS back to its original location by FTP, SFTP, FTP/SSL or directly to a hard drive or network share. Plus, it remembers where remotely loaded CSS files were last saved, so you only need to choose the location once. Set the preview pane to a specific size, make presets for your breakpoints, and switch between presets with a single click. Laser-like guidelines follow your mouse to help you ensure the elements on your page are properly aligned, and display measurements in a digital readout. Ensure per-pixel accuracy by blowing up a portion of the browser by 8 times its original size. The lens can either follow your mouse or be locked in place. We've made every effort to accomodate even the most die-hard emacs fanatic with a personal collection of IBM Model Ms (you know who you are). Efficiently control all of Stylizer and your CSS without going anywhere near a mouse. Clearfix is a technique that web designers use to ensure that a container element expands to contain all of its floating children. 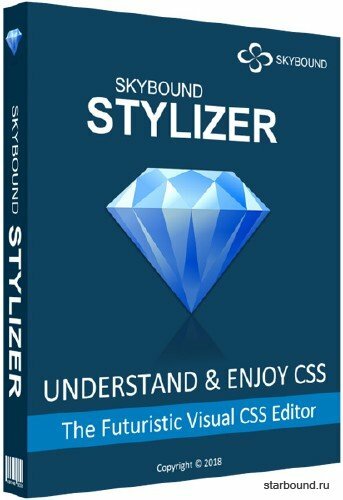 Stylizer streamlines this process by generating all of the necessary CSS for you with a single click. Немного информации об материале: 30-10-2018, 19:54 наш лучший журналист - super-boy написал статью - "Skybound Stylizer 7.18.904.712" и сразу же добавил её к нам на сайт! Хотелось бы добавить, что наш журналист подобрал лучшее оформление и качественное содержание данной новости. Так же советуем вам посетить категорию Софт, чтобы найти другие отличные материалы, как и этот!